Namdaran Petrogas Industries (NPI) provides pig signalers / indicators for pipeline industry. The pig indicator is a device that is used, to detect the passage of a pig in the pipeline. - All pig signalers are bi-directional for operation through a minimum hole diameter of 39 mm. All models can be set to suit varying thickness of line pipe of any diameter of 6 “and above without being limited to pre set lengths of mounting base. The internal mechanism can be adjusted maximum 25mm. - Pig signaler is manufactured in three pressure classifications - up to Class 2500. Standard models are designed for use at temperatures from -29ºC to 200ºC, dependent upon the line products and pressure. - Pig signalers are available in a wide range of models - mechanically operated signal flags, electrical auto resetting switches, or mechanical and electrical signals in combination, to suit either welded, or flanged type mounting. 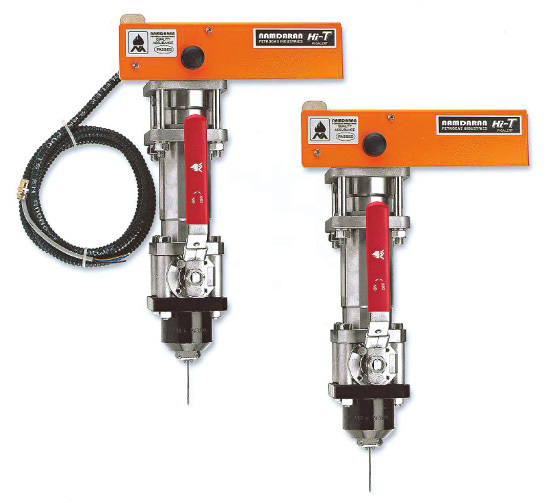 - Pig signalers can be supplied with integral valve/DBB to allow removal under line pressure. - Pig signalers feature a unique trigger penetration adjustment facility to cater for variations in line thickness and flange standout. - The pig signaler is classified in two types: models which are not designed for removal while the line is under pressure, and models which are fitted with an integral valve and suitable for controlled removal when the pipeline cannot be de-pressurised. - A simple jacking bracket tool is available for this purpose, consisting of a safety screw mechanism and bridging clamps to allow rapid removal and re-installation of the pig signaler from the line under pressure.